(dut)The author was born as Tomas Straussler. After the death of his father, his mother married the Brittish Major Stoppard, and Tom since accepted his name. Join us for a reading group discussion of The real Inspector Hound by Tom Stoppard! Specifically "Dogg's Hamlet" and "Cahoot's Macbeth"
Culled from nearly 20 years of the playwright's career, a showcase for Tom Stoppard's dazzling range and virtuosic talent, The Real Inspector Hound and other plays is essential reading for fans of modern drama. The plays in this collection reveal Stoppard's sense of fun, his sense of theater, his sense of the absurd, and his gifts for parody and satire. Join us for a reading group discussion of Dogg's Hamlet, Cahoot's Macbeth by Tom Stoppard! This clever romp is two short plays. In the first, a troupe of English schoolboys (played by adults) speak in a mock language called "Dogg." This hilarious language babbles along until the schoolboys, who are studying Shakespeare's "foreign" language, present an incredibly funny 15 minute version of Hamlet and then encore with a two-minute version! The second play, dedicated to dissident Czech dramatist Pavel Kohout, is about a performance of Macbeth he and his friends once staged in a living room since the government banned public performances. Tom Stoppard reads from Tom Stoppard Plays: 3. Admission €10.00/€8.00. In association with Irish PEN. " Shakespearean. Pinteresque. Stoppardian. Once your surname becomes an adjective, you've pretty much hit cultural Nirvana. Sir Tom Stoppard is one of the world's most celebrated and influential playwrights, his distinctive oeuvre characterised by big ideas, coruscating wordplay and passionate humanism. Stoppard’s 1967 breakthrough Rosencrantz and Guildenstern Are Dead set the benchmark, earning the playwright a Tony on Broadway and paving the way for international success on stage, screen and radio – from Jumpers (72) to Rock 'n' Roll (06); from Brazil (85) to the BAFTA winning Shakespeare in Love (98). Tom Stoppard is currently considered a "single author." If one or more works are by a distinct, homonymous authors, go ahead and split the author. 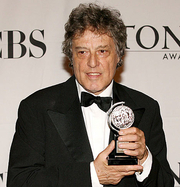 Tom Stoppard is composed of 9 names. You can examine and separate out names.